RAWinfopages covers the latest computers, phones, tablets, gadgets, peripherals, the internet, website building and more. It’s aim is to make technology simple. RAWinfopages provides help, tips, solutions to problems, how-to guides and features for using computers, peripherals and gadgets, the internet, phones, tablets, Windows, macOS, Android and iOS. There are also reviews of software for Windows PCs and Apple Macs, and apps for smartphones and tablets, and a lot more. The aim is to make technology simple. This website and nearly all of the articles that are featured here have been created by Roland Waddilove, a technology writer living in the UK. He writes almost every day on a wide variety of tech subjects for the web and for print magazines. 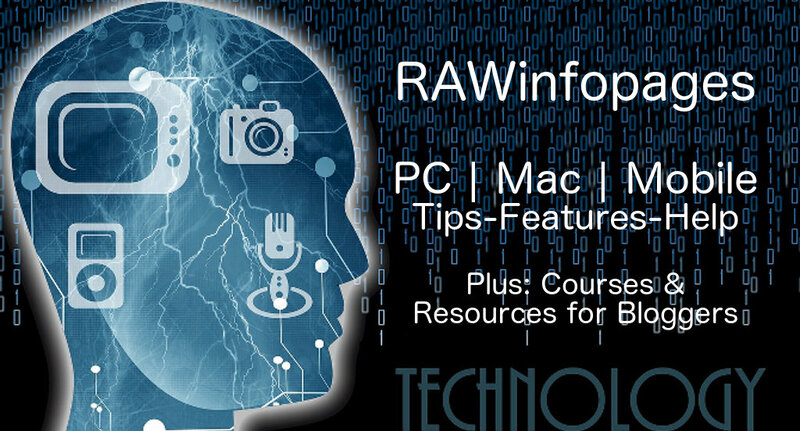 RAWinfopages is a great place to post articles on a wide range of tech subjects and writers are welcome. Roland Waddilove is the person to contact regarding anything about RAWinfopages – writing, advertising sponsored posts and so on. Some of the images are from pixabay.com – a great source of free photos and artwork. Some photos are (c) Roland Waddilove and are not to be used elsewhere.